Poké is a Hawaiian fish salad, which traditionally uses chopped cubes of yellow fin tuna with seasoning like sesame oil, salt and soy sauce. It has become very popular in certain American cities. Aloha Poké, one of the first restaurants to focus on poké, opens in Singapore. It is started by two young couples and helmed by the previous chef de cuisine of Capella hotel – Chef Michael Yonathan. Chef Yonathan is a trained sushi chef and also happens to be a top five finalist in the first season of Hell’s Kitchen Indonesia. You start with choosing how many scoops of poké you want. One, two and three scoops of 75g poké cost S$11.90, S$15.90 and S$19.90 respectively. The most common choice is two scoops. 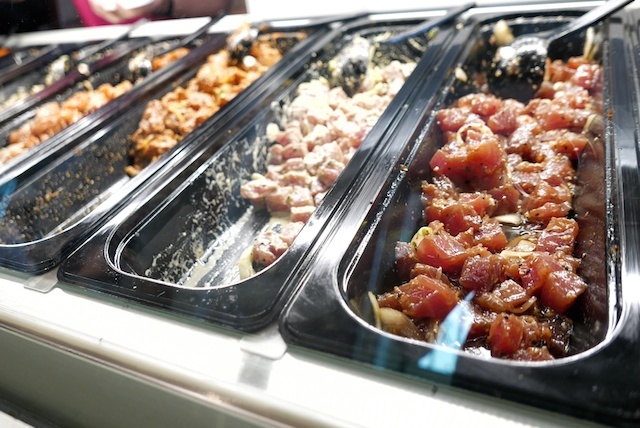 You have six choices of poké – either Tuna or Salmon, and in three different seasonings – Original, Wasabi Mayo or Spicy. You can mix and match if you choose more than one scoop. Both the wasabi and spicy seasonings are quite strong so if you chose two scoops, it is better to balance between an original and a wasabi or spicy option. You then get to choose a base that includes white rice, brown rice, a mix of both or stay carbo-free with no base. 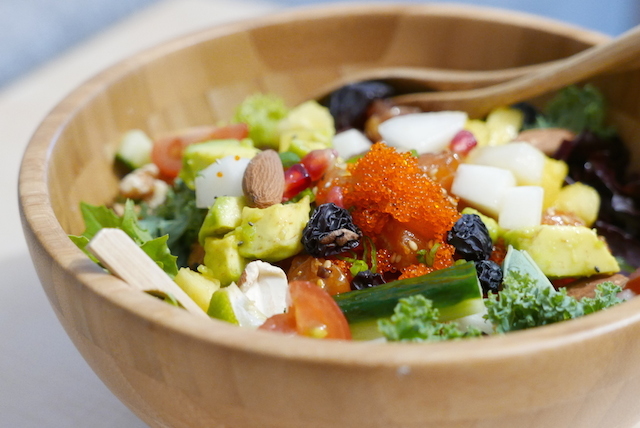 Lastly, you get two add-ons from a “Fresh” range of cucumbers, jalapenos, carrots or cherry tomatoes, or from the “Crunchy” range of flying fish roe, almond, walnut, dried grapes or raisins; plus one “Superfood” – avocado, chia seeds or pomegranate. They then mix all the chosen ingredients with a salad that includes pineapple cubes, spring onion and lime. It sounds like a very extensive process but it is all done with a simple do-it-yourself order sheet. You pay at the order counter, take a seat, help yourself to complimentary ice water and wait for your poké to be sent to your table. The menu after 5pm is different and offers only a Poké Sampler (S$11.90) and the Ultimate Poké Bowl (S$17.90). 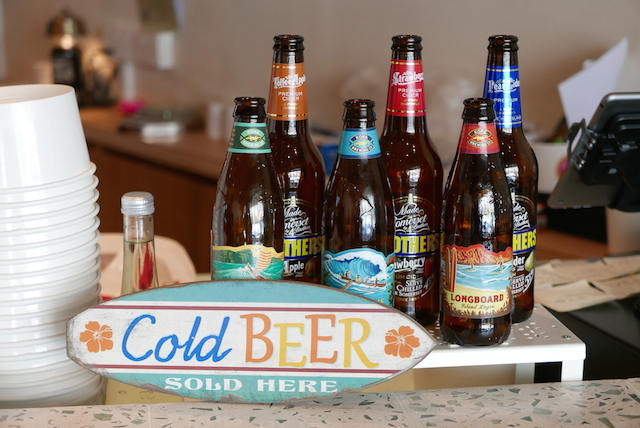 Aloha Poké also has a Tiki Bar within the restaurant to offer beer and cocktails to compliment your favourite fish salad. 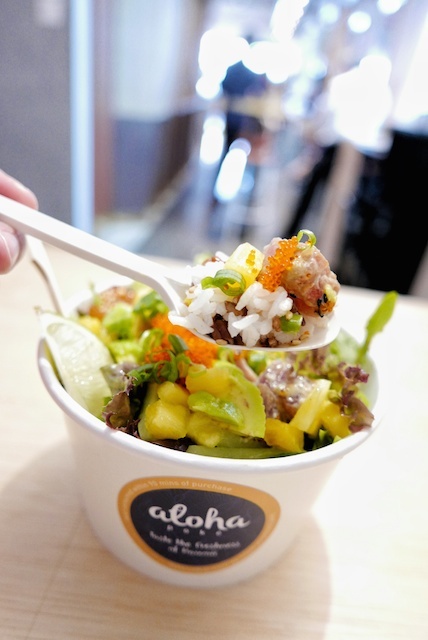 With a casual relaxing ambience, soothing Hawaiian music playing in the background, and healthy poké as a meal or snack, Aloke Poké could be an ideal place for busy executives to chill and get a little taste of the Hawaiian lifestyle. Aloha Poké is located at 92 Amoy Street, Singapore 069911. Call +65 6221 6565 for queries. Aloha Poké opens for lunch from 11.30am to 2.30pm (Mondays to Saturdays), and for dinner, drinks and snacks from 5pm till late (Mondays to Saturdays). Closed on Sundays.